I read non fiction so rarely, apart from work related reading, that whenever I find myself reading something for interest and enjoyment that is not fiction I have to wonder if I am feeling unwell. And as for philosophy, I know many of the names of the biggies from bits of sound bites gleaned here and there, but that is about all. Enter Alain de Botton, I am sure the man could make a phone directory seem fascinating. His style is so witty and light, yet completely relevant, that I found myself unable to put this book down. The lives and wisdom of Socrates, Epicurus, Seneca, Montaigne, Schopenhauer, and poor old Nietzsche are used by de Botton to offer explanation and consolation of the modern ailments of unpopularity, not having enough money, frustration, inadequacy, a broken heart, and difficulties (difficulties of course being about Nietzsche, he had a great many). 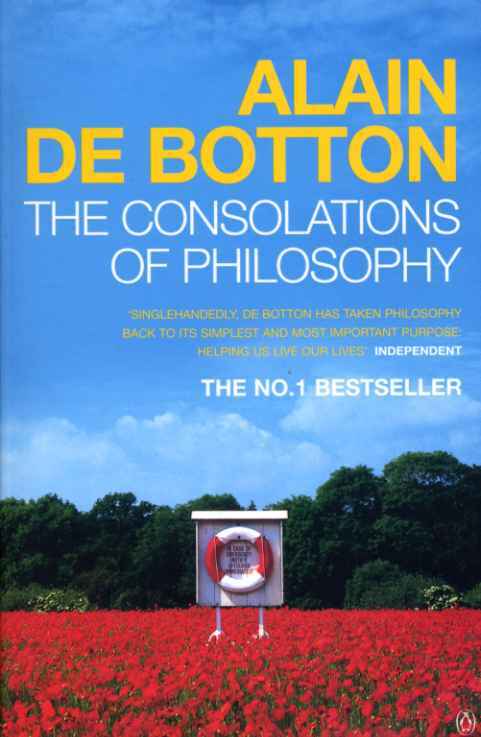 De Botton's own philosophical understanding must be epic, because he manages to distill the teachings of each of these five down to forty or so pages, complete with little pictures and hilarious modern day applications of their teachings. It is quite brilliant. And best of all for me, I would feel perfectly comfortable after reading this book to pick up some of the original work (translated of course) that Consolations draws on. De Botton includes a comprehensive notes section in the back that could direct anyone to do this. This book has been sitting on my shelf for some years. I suspect, recently reading Thomas Hardy's Jude the Obscure, might have had something to do with me venturing to pick it up. Jude's thwarted love of learning really moved me. See, who said a novel can't change your life? 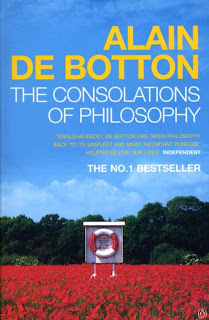 De Botton has apparently written a book on the very subject regarding Proust. That one may have to wait, I have his, The Art of Travel waiting to be read next. If you are interested in Alain de Botton's work, he has a very user friendly website. I have not read deBotton, and the books about of "philosophy" sort of make my eyes glaze over, but this one sounds like it might be accessible, and even fun -- thanks! Sean - I remember finding them fascinating too. Although the idea that true contentment lies in being able to walk away from everything you own and hold dear, is a daunting but impressive prospect. Becky - I am a big Bill Bryson reader too. There are similarities. Perhaps Bryson is more effortlessly funny and De Botton is more effortlessly clever, but both are very enjoyable and accessible.